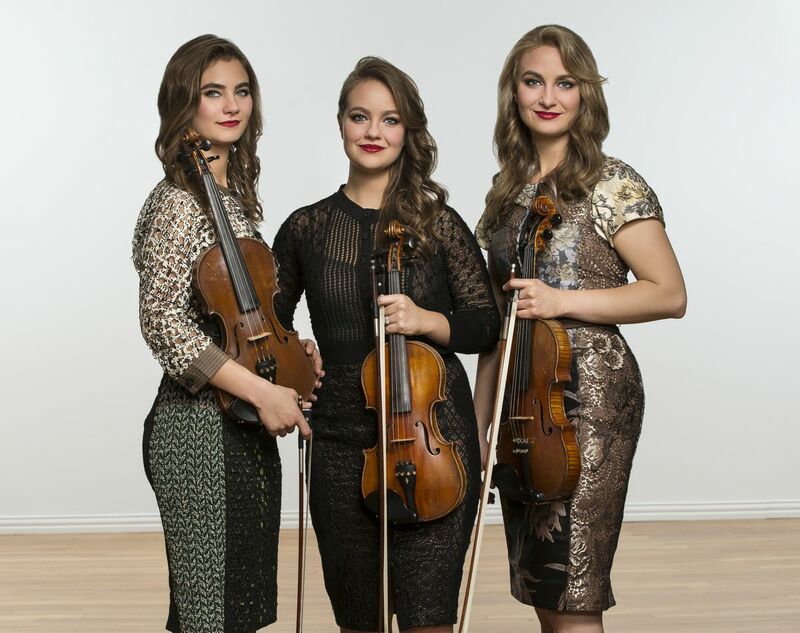 The Quebe Sisters will perform in Anchorage this Saturday. The Quebe sisters were getting restless. Grace, Sophia and Hulda waited patiently as they each took individual fiddle lessons near their home in a suburb of Fort Worth, Texas. Finally, their instructor, Sherry McKenzie could sense they were ready for a new challenge. "Do you want to learn something in harmony?" Grace Quebe recalled McKenzie saying. The sisters took the Texas-style harmonies and started working in triples. Nearly 20 years later, the Quebe sisters are among the foremost practitioners of Western swing fiddle and are expanding the triple fiddle sound into different genres. "We're an anomaly," Grace Quebe said. "Western swing definitely has its roots in Texas and Oklahoma. When you're from Texas and play triple fiddles, people know what to expect. But as much as we are influenced and arrange in that style, we have some gospel tunes and some bluegrass tunes. We play cowboy tunes and love gypsy jazz and do country shuffles." The Texas fiddle style that the sisters were raised on is popular throughout the state and is played in contests throughout the south. When they started competing in 1998, Grace was 12, Sophia was 10 and Hulda was 7. Soon, they were earning state and national titles in the competitions. "We competed a lot, but as far as the three of us, we've never been competitive," Quebe said. "We've always been really pro each other. Sibling rivalry was never a thing for us." But sibling harmony is. The sisters create a sound that's taut and lively without being strained. "Sibling harmony is definitely a thing and it's an advantage," Quebe said. "You generally phrase things the same. As far as my sisters, we think the same. We've had so many of the same musical experiences. All those influences shape us the same way." Over the last two decades, those experiences have included sharing the stage with country music luminaries like the late Merle Haggard and George Strait as well as Western swing champions Asleep at the Wheel. The sisters are set to play the Discovery Theatre on Saturday, with a couple of Alaska shows in Cordova and Haines under their belts. They'll play Juneau's Thunder Mountain High School on Sunday. "We've got some school outreach we'll be doing," Quebe said. "We've never been to Alaska. It's going to be the trip of a lifetime." She said attendees can expect a "country show with several different genres." "We try to keep a good mix to upbeat and slower songs," she said. "We're an acoustic band. You're going to hear archtop guitars and a standup bass. We also strive to do is bring in new influences that we hear, we want to bring them in stylistically." That combination of tradition and experimentation forms the basis of the Quebe sisters' upcoming album. "We're getting ready for our next record, and we're working on that right now," Grace said. "We want to expand some of the melodic arranging for triple fiddles. We're going to start arranging with a five-string fiddle. It is a challenge to get three parts on instruments that are voiced the same way. It's quite a trick. We do some traditional stackings, but when we can, we try to mix it up."